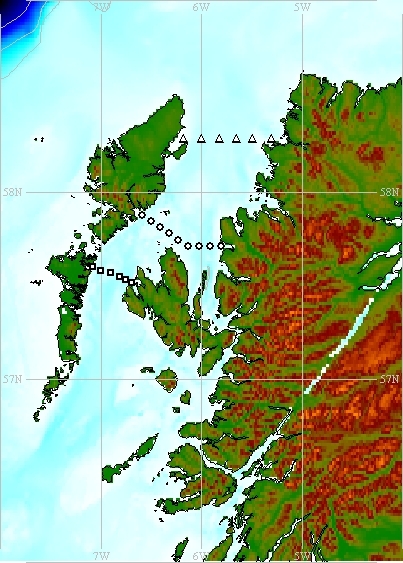 Line K is a survey section in The Minch, Scotland, crossing between Loch Seaforth (Isle of Lewis) and Loch Gairloch (Scottish mainland) via Trodday on the northern tip of the Isle of Skye. The line comprises nine fixed CTD stations, which were established as part of routine monitoring work on the Scottish continental shelf by Dunstaffnage Marine Laboratory (DML). Line K was occupied between the late 1970s and the early 1990s. Station 4K is one of nine fixed CTD stations crossing The Minch between the Isle of Lewis and the west coast of Scotland, via the northern tip of the Isle of Skye. The station was established by scientists at Dunstaffnage Marine Laboratory (DML).